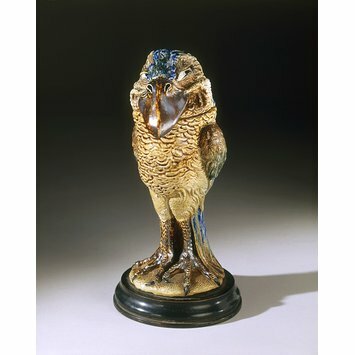 The output of the Martin Brothers pottery of London was always highly ornamented, even including its useful wares. The brothers were intensely interested in surface decoration. They made almost any type of ware from clockcases to tablewares to jardiniéres (stands for flower pots). The Martins worked exclusively in salt-glazed stoneware with a distinctive semi-matt, speckled surface and a limited colour range of browns, blues and greens. Their wares usually have additional incised decoration and sometimes applied ornament. The heavily modelled exterior of this jar, though described as a tobacco jar, means that there is little room inside to store tobacco. There were four Martin brothers, and they worked as a team. Robert Wallace (1843-1923), the eldest, was generally responsible for throwing and modelling, Walter Fraser (1857-1912) for decorating, and Edwin Bruce (1860-1915) for glaze development and kiln management. In practice, each could take on the role of the others. From the late 1870s Charles Douglas (1846-1910) ran the brothers' sales from their shop in Brownlow Street, Holborn, London, but even he is known to have produced some models. However, the Martins did have outside help for both the practical side of the business, such as the throwing and firing, and also for some designing and modelling. 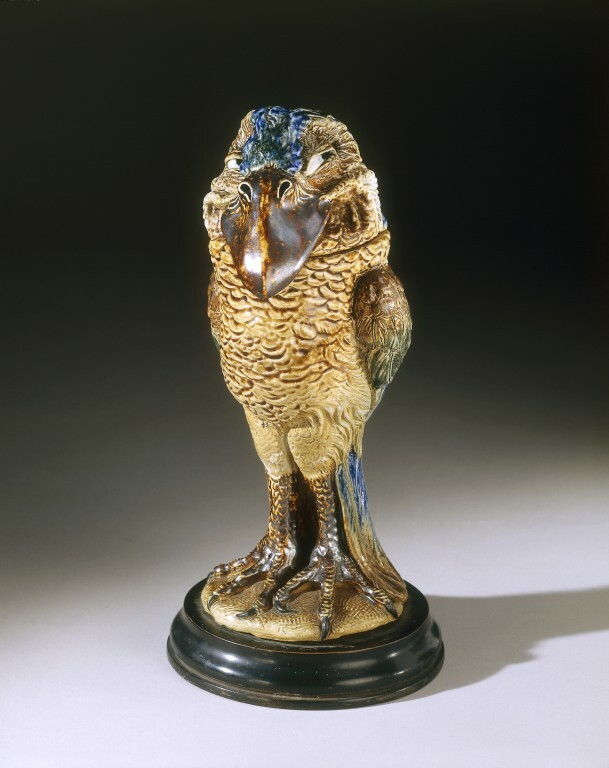 Robert Wallace is most commonly associated with the sculptural bird models, such as this jar. There is no suggestion that any designer or sculptor other than a Martin brother was responsible for any of these highly and distinctively characterised designs.